“Make careful choice of the books which you read: let the holy Scriptures ever have the preeminence. Let Scripture be first and most in your hearts and hands and other books be used as subservient to it. 1. Could I spend this time no better? 2. Are there better books that would edify me more? lovers of the Book of God and of a holy life? kill my sin, and prepare me for the life to come? 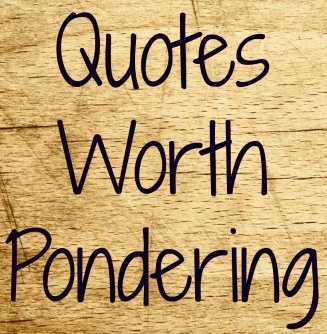 sayings like firmly embedded nails—given by one Shepherd. So on what basis, at the most troubling time of their lives, were the disciples supposed to trust in God? For that matter, how are we supposed to trust God when it seems like our world is crumbling around around us. 1) I trust those that I know well. For instance I trust my wife. I have a 35 year history with her. I know that she will do what she says. She is a woman of integrity and has shown herself to be trustworthy over the years. If we have trouble trusting God it may be that we don’t really know Him as well as we should. I know that in my own life He has demonstrated over and over that I can trust my life to Him. Because I know Him, even when life is hard I know that He is still in control and walking with me every step of the way. 2) I trust those whom I trust, trust. I know that sentence sounds kind of funny but here’s what I mean. I have a friend who is great at fixing stuff and has fixed lots of stuff for me because I am a fix-it klutz. I have tremendous trust in him. But if there is something that he cannot do I will ask for a recommendation of someone who can do it. And almost always I will go with his recommendation. Because I trust him, I trust those that he would trust. In the same way, I know that I can trust God because people who I have complete trust in have shown me that they trust Him even when, and especially when, they are in crisis mode. Because I trust them, and they trust Him, I can trust Him. Kind of like the math principle: if a=b and b=c then a=c. 3) I trust God because I know that I can’t trust myself . I am often reminded (by my own actions and thoughts) that my “heart is deceitful above all things, and desperately sick” (Jeremiah 17:9). If it were up to me I would always choose the easy way. I would look out for #1. I would always make decisions based on what is best for Me Me Me. Because if I did not or could not trust God, it would all be about me. And if there were no God to trust, why it shouldn’t it be. But because God has shown me that there is a better way to live – a way that brings me satisfaction and joy and purpose and hope – I can’t help but to put my trust in Him. There is a lot of emotion in this passage. Think about what Jesus was dealing with emotionally on this night. The cross loomed right before Him. He knew He would soon experience the devastation of being separated from God. He was having His “last supper” with friends that He had spent three years pouring His life into. He knew that one of them was preparing to betray Him. He knew that one of them would soon deny Him. Verse 21 says that Jesus was “troubled in spirit.” I can’t even imagine what He was going through. Think about what Peter was dealing with emotionally on this night. He had just recently heard Jesus predict His imminent death. That had to be unsettling. He knew that the Pharisees had taken out a hit on Jesus. He had just watched Jesus wash his feet and didn’t quite know how to deal with it. And now he is learning that there is a betrayer in their company. These 11 other men that are his best friends on the face of the earth – and one of them is about to sell Jesus out. Peter wants to know who it is so he can stop it from happening – this is the kind of thing Peter does. He reacts! And then finally Jesus looks Peter in the eye and says, “before the rooster crows, you will disown me three times.” No doubt this got his blood pressure higher than it should be. There had to be so many different emotions that he was feeling. There is a lot of emotion in this passage. But there is also a lot that baffles me – especially regarding Judas – because I fear that there is something of Judas in me. How could a man who had watched Jesus and talked with Jesus for as long as Judas had decide to betray Him? It would seem that he was disappointed and disillusioned. For all of Judas’ hopes, Jesus was not the kind of Messiah he was looking for. Jesus, as it turned out, was not fulfilling the dreams that Judas had. Now isn’t that the reason that so many in our world today are disillusioned with Jesus. He is not making their dreams come true. But Jesus did not come to fulfill our dreams. The narcissistic brand of faith that is so prevalent today is not only shallow but also unfulfilling and unsatisfying. Our world has been so taken in by the lures of this world that we cannot see how empty our dreams have become. It is only when when we begin to dream dreams that are Spirit inspired that we will find the kind of life we are longing for. It is as sad thing that Judas never found this. Our last few sabbatical days were spent on Lake Geneva. One night in Lausanne, and our last night in Geneva. 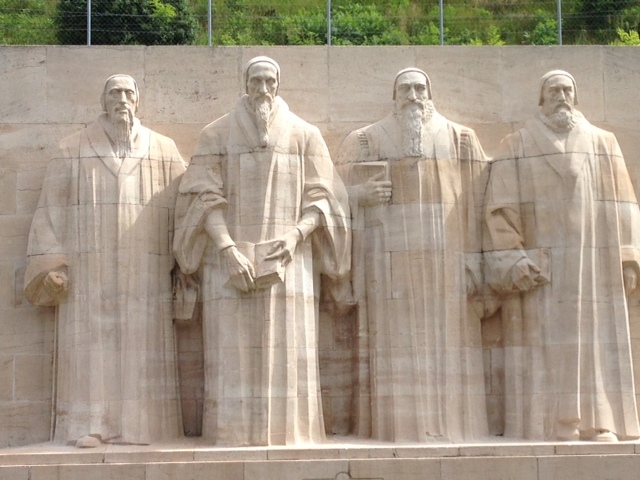 I was particularly interested in visiting Geneva because it was the home of one of Christendom’s most prominent reformers – John Calvin. John Calvin was born in 1509. He was 8 years old when Martin Luther nailed his 95 theses to the Wittenberg door and launched the Protestant Reformation. He was 14 when he left home for the university. He was somewhere around 20 when he was converted to faith in Christ. And he was 26 when the first edition of his magnum opus, The Institutes of the Christian Religion, was published. This first edition debuted in March of 1536 and was a relatively short book—nothing close to the 1000-plus pages of the final edition. The first edition was designed to be small enough to fit into a coat pocket so it could be carried and referenced at any time in any place. Calvin would later write, “All I had in mind was to hand on some elementary teaching by which anyone who had been touched by an interest in religion might be formed to true godliness. I labored at the task especially for our own Frenchmen, for I saw that many were hungering and thirsting after Christ and yet that only a very few had any real knowledge of him.” Amazing that this elementary teaching would grow into one of the most important books in the history of the church. We traveled from Zermatt to Luzern, taking the rain with us. Still, with umbrellas in hand, we had a fun afternoon exploring this Swiss town which is a mixture of old and new. 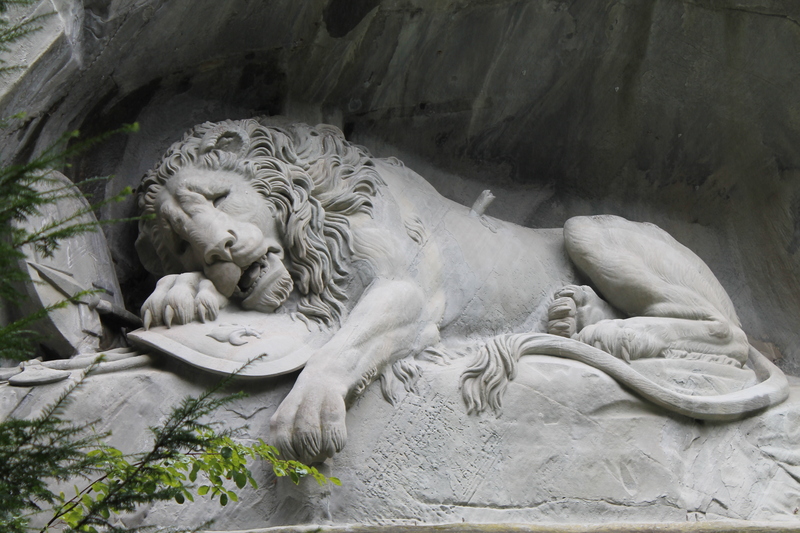 One of my favorite Luzern sites is the The Lion Monument or the Lion of Lucerne. It is a sculpture hewn out of rock that commemorates the Swiss Guards who were massacred in 1792 during the French Revolution, when revolutionaries stormed the Tuileries Palace in Paris, France. Mark Twain praised the sculpture of a mortally-wounded lion as “the most mournful and moving piece of stone in the world.” It made me think of Aslan, the Lion Christ-figure, as he lay mortally wounded at the end of C. S. Lewis’ The Lion, the Witch, and the Wardrobe. It really is an awesome piece of art. Because of the rain we abandoned our original plans for the following day and took a day trip down to Interlaken. The highlight of this excursion is the train trip – a two hour rail ride through some of the most scenic landscape in the world. 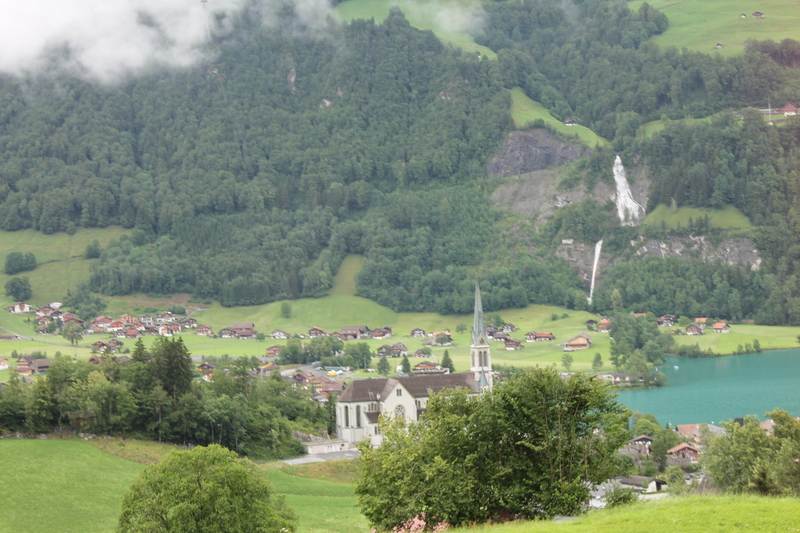 Lakes, waterfalls, mountains, sleepy little Swiss villages. One of the towns we passed by is called Lungern. I was captivated by its beauty and told Linda, in jest, that maybe God was calling me as a missionary to this little Swiss village. I like that last phrase, the “happifying beauty of God”. He is telling us that when we fix our gaze upon the beauty of God, when we begin to see Him and enjoy Him and magnify Him for who He is, then our hearts will be made happy and we will find joy in our journey. But I will need to be intentional to do this or it will not happen – and will then continue to wallow in the ordinaryness of the mundane. Shame on me if I let this happen. Zermatt was our first stop of our 1 week jaunt into Switzerland after having spent 3 weeks in Italy. It was the beginning of the end of our sabbatical travels. I had been to Zermatt on 3 other occasions. After my freshman and sophomore years in high school when I had the opportunity to attend a ski camp and then 34 years ago when I traveled around Europe for a month with a buddy after our college graduation. In my humble but accurate opinion it is one of the most beautiful places on earth. Not only is the town of Zermatt an idyllic Swiss village, but the Matterhorn stands as a magnificent sentinel, casting its iconic presence over the entire valley. 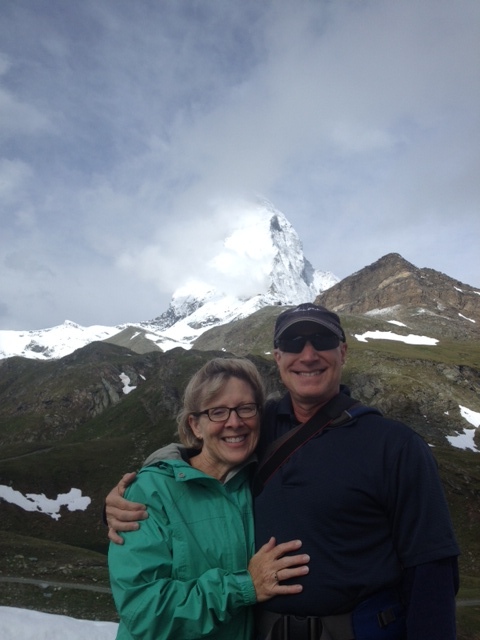 I had been telling Linda for 34 years that I wanted to take her to Zermatt. And I was hopeful that our pilgrimage there would live up to my memories and expectations. We arrived midday on Monday, settled into our hotel, and it promptly began to rain. It rained through the night and all day Tuesday, and the weather report was calling for more of the same on Wednesday – our last day there. We did not come prepared for rain and cold (and were not willing to spend $75 dollars for a sweat shirt and/or a rain jacket) so we mostly stayed inside and read and rested and reflected on Wednesday. All of which was profitable but not what we had come for. At this point we had not even seen the Matterhorn as it was shrouded by a thick layer of low lying clouds. And while we rested my wife was praying that the weather would break and she could at least get a glimpse of the Matterhorn. So when we wake up Wednesday there is a heavy cloud cover but no rain. So we decide to take a skylift ride up the mountain and hike the 4 hours back down, knowing there was good chance we would get rained on. When we got to the top we were above many of the clouds and there was the Matterhorn from top to bottom. And my wife cried. And I was happy. The hike down was incredible. It sprinkled on us a few times but nothing too bad. 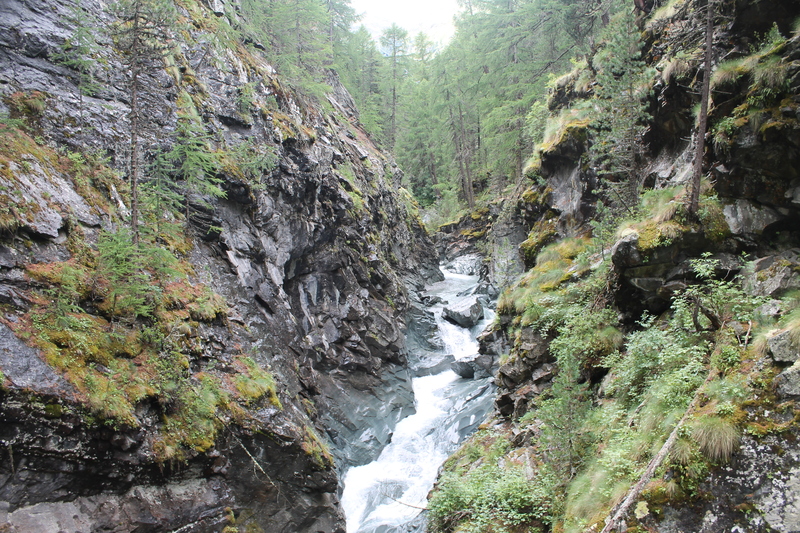 We wound through several little pristine hamlets, saw waterfalls, got up close and personal with some cows, and then hiked through the Gorner Gorge – which is a spectacular crevice in the earth through which a river runs. 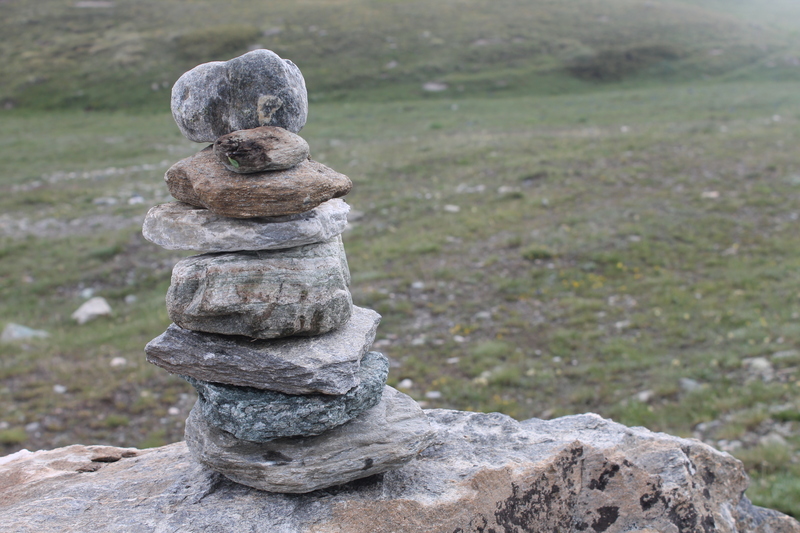 For many reasons, which I won’t go into, the hike was a very spiritual experience for us and perhaps will be the highlight among many highlights of our journey. Indeed! 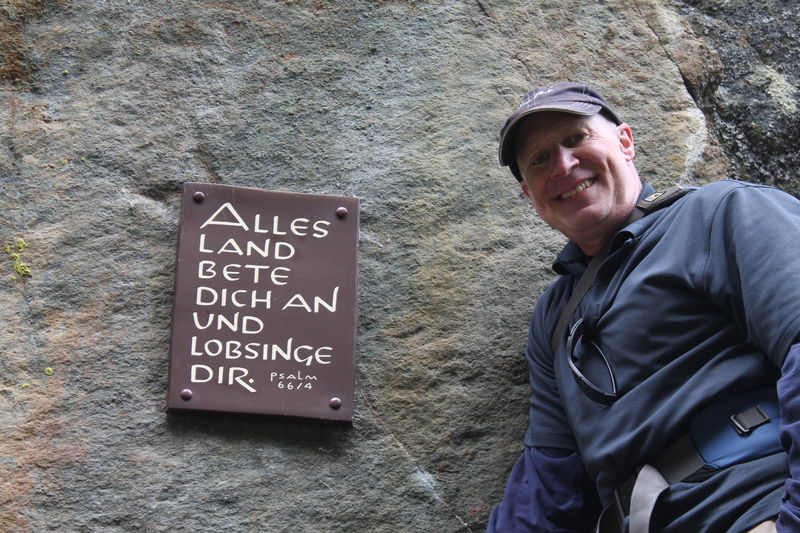 And may that be true for us as we continue our pilgrimage – long after our sabbatical journey is over. Do you understand the price that was paid for your salvation? Do you understand that though salvation is a free gift to you, it cost me my life? Do you understand that you were doomed to spend eternity in hell if I had not gone to the cross on your behalf? Do you understand that your life no longer belongs to you? It has been redeemed – bought and paid for with my blood. Do you understand the amazing gift of grace and that you were completely undeserving of this gift? Do you understand the incredible power of forgiveness – and now that you have been forgiven you can offer forgiveness to those who have hurt and wronged you? Do you understand that you are now a new creation – that your life has purpose; it is not a waste? Do you understand that you have been blessed so that you can be a blessing to others? Do you understand that now there is great hope for the future, whereas before there was only despair. Do you understand that there is absolutely no reason to fear death any longer? Do you understand that there is a reason for everyday to be a day of joy and gladness? Do you understand that you are loved beyond your wildest imagination? Do you understand that you have been reconciled to the God that created you – though once you were far away from Him, now you have been brought near?